Why is Donald Trump so obsessed with TV ratings? Why Is Donald Trump So Obsessed With Ratings? The Apprentice theory of the Trump candidacy. Donald Trump attends the Celebrity Apprentice press conference at Jack Studios on Oct. 12, 2012, in New York City. 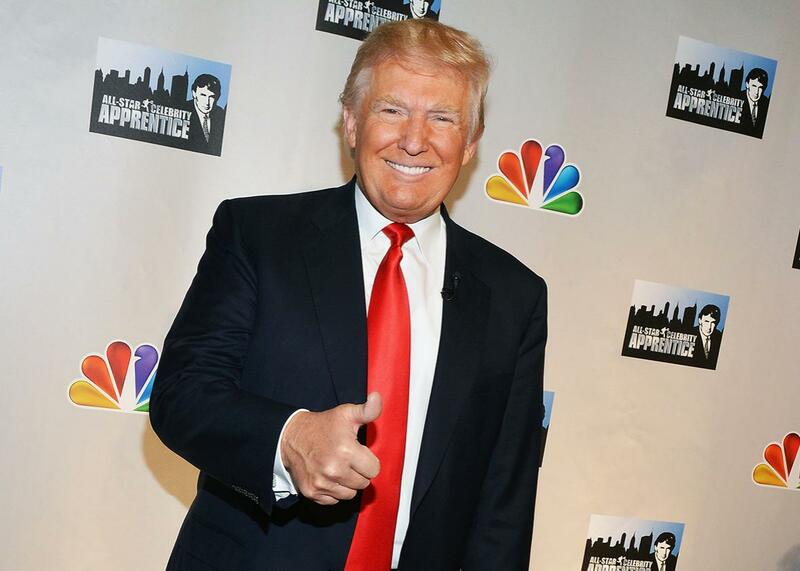 In January 2015, Donald Trump stood in front of an audience at the Television Critics Association winter press tour and told the assembled reporters that The Apprentice was TV’s No. 1 show. Though that had once been true, the franchise had long since fallen into disrepair, and Trump’s assertion met with, in the Hollywood Reporter’s phrase, “muffled laughs.” According to Dan Fienberg, who was there at the time on behalf of HitFix, reporters began to press Trump. * He clarified that The Apprentice was just the highest-rated show on Mondays. That wasn’t true, either, as Fienberg pointed out to Trump. Trump was flustered for a moment, then he shrugged. “That’s just what I had heard,” he said, per the Hollywood Reporter. Remember this exchange: I assure you Trump does. It contains what I’d propose is the secret of his campaign. If my theory is correct, it is as significant a moment in the cosmology of Trump’s bid for president as his filleting at the hands of President Obama at the infamous White House Correspondents’ dinner in 2011. Trump cares about ratings a lot. He cares about ratings because the value of a thing, in his mind, is entirely a function of its ordinal positioning. He’s always talking numbers, one way or another. During one recent campaign stop, he counted up every reference that Hillary Clinton made to him in her Democratic National Convention address—22 in all. He also routinely talks polling data—mostly when the numbers are in his favor, but sometimes even when they’re not. But no single metric matters more to him than television ratings—so much so that even polls are secondary for him. In an age of time-shifting and binge-watching, Trump’s fixation on ratings might seem old fashioned, and it is. But it’s also key to understanding how he thinks. Twitter is an apt platform for Trump’s numerical interests, not least of all because the site’s like and retweet counters offer easily accessible metrics. What’s better than bragging about boosting John Dickerson’s Face the Nation audience? Presumably, knowing that 1,300 of your fans shared that news with their followers. Still, he exhibits similar tendencies offline as well, as he did at a New Hampshire rally in 2015 when he seemed to attribute the first GOP primary debate’s 24 million viewers to his refusal to be politically correct. That claim was telling, indicative of Trump’s conviction that people tuned in for him and him alone, even if they didn’t know what he’d be saying. Since then, he’s repeatedly shown that he thinks viewership numbers are a—perhaps even the—key marker of victory. After the conventions concluded, he thanked his supporters on Twitter, writing that “Nielson [sic] Media Research final numbers” indicated almost 4.5 million more people had tuned in for his speech than for Clinton’s. (The difference was actually a less-significant 1.2 million viewers in Trump’s favor.) Though subsequent polling would suggest that speech—and all the pomp surrounding it—had been disastrous for his campaign, edging out Clinton in this one domain was enough for him to take a victory lap. As he does elsewhere, Trump conflates ratings with reviews, and spectacle with the substance of the thing, effectively confusing cause and effect in the process. Fabricated as it is, this supposed crisis brings together a handful of Trump’s pet preoccupations. Notably, it links his fixation on football masculinity—best embodied by his disastrous attempt to own a professional team of his own—to his proclivity for conspiracy theory. Above all else, though, it exemplifies his belief that what matters most is the number of eyeballs you can glue to a screen. Convinced that football will distract audience members who would otherwise happily watch him bloviate, Trump fears he’ll somehow lose prestige. It’s this anxious conviction that Gingrich—ordinarily an independent thinker, whatever his other faults—appears to have internalized, turning him into a ventriloquist’s dummy puppeted by Trump’s pursuit of numerical supremacy. Fittingly, Trump seems to have developed his fixation on ratings while working on The Apprentice, a connection he acknowledged while keynoting a 2014 National Press Club luncheon. “I learned a lot about ratings through The Apprentice. Your television audience disappears in the spring,” he said to the diners, proposing that an event was only worth doing if you could get enough people to tune in. Fienberg confirms this insight, telling me, “He was No. 1 on TV for a brief period, and that’s something he likes to point to.” In other words, The Apprentice was good for Trump because it offered him definitive, but temporary, evidence that he was the best. Ultimately, though, The Apprentice is revealing in other ways as well, not least because it suggests Trump was more concerned with the perception of high ratings than the fact of a large audience. Business Insider reports that, in mid-2015, Trump sent the publication PDFs of ratings data with handwritten annotations, trying to disprove assertions that his show’s audience had shrunk. Sensing a weakness, Mark Cuban has taken to needling Trump by pointing out that, ratings-wise, his own show Shark Tank shellacked The Apprentice. Given that Trump, as BuzzFeed News’ McKay Coppins has memorably shown, sometimes seems to be driven by resentment alone, the chuckles of that audience must have sat poorly with him. Examples of Trump’s thin skin abound, including a snide note that Trump sent to Coppins shortly before the Republican National Convention, responding to a critical article from two years prior. For Coppins, however, the most important incident is surely the 2011 White House Correspondents’ dinner. Coppins writes that Trump—in attendance as a guest of the Washington Post—“just sat there, stone-faced, stunned, simmering” while the president hammered him “with one punchline after another.” His humiliation that night fed the great furnace of resentment in the cellar of his being, leading inexorably—at least in this version of the Trump candidacy—to his first real run at the presidency. But think back to the bemusement of those television critics. Obama had refused to take Trump seriously, calling him a fool in front of a national audience. That must have been a slap in the face, but it also elevated Trump by marking him as a man worthy of the president’s attention. The critics, on the other hand, were laughing at Trump’s claim to be the best, demolishing the phony empiricism of the fantasy that sits at the foundations of his self-image. How else could he respond? They laughed at his ratings, so he went looking for a new way of getting ratings, the best ratings. From this perspective, Trump’s campaign looks like something other than a pursuit of power: It looks like an attempt to show up a gang of bemused reporters and prove that Trump still has the biggest show on television. Worse still? He may be right.